the priority of limiting this effort in a long-term comprehensive nuclear agreement. Some of the claimed enrichment output is exaggerated as a result of Iran’s use of a non-standard unit for quantifying enrichment output and of theoretical upper bound estimates of centrifuge output. Nonetheless, the IR-8 is more advanced than the IR-2m centrifuge, Iran’s most developed advanced centrifuge. Based on a set of rough estimates, reflecting a lack of data, the IR-8 centrifuge may represent a potential growth of one or two generations in centrifuge development. However, Iran has a history of exaggerating its nuclear accomplishments and the nomenclature it uses for its advanced centrifuges provides no indication of the relative enrichment capacity of a particular centrifuge. Although some nations with centrifuge programs indicate generations of advancement through the numerical nomenclature assigned to a type of centrifuge, such as Pakistan’s P1, P2, and P3, Iran does not. For example, the IR-2m and IR-4 are similar in output and the IR-4 is not two generations more advanced than the IR-2m, as the nomenclature could imply. The IR-6 is reportedly the same size as the IR-2m but wider in diameter and would be expected to have roughly the same enrichment output as the IR-2m centrifuge. But what is the enrichment output of the IR-8? Is the claim credible about it being 16 times more capable than the IR-1? This technical note attempts to make sense out of Iran’s non-standard method of defining enrichment output and in particular the potential output of the IR-8 centrifuge. Based on this preliminary analysis, the IR-8 centrifuge is likely far less capable than implied by a literal reading of Iranian statements about enrichment outputs. Nevertheless, its size—both longer than the IR-1 and wider than the IR-2m centrifuge—would imply a capacity far in excess of the IR-1 centrifuge, at least theoretically. If Iran’s past experience in developing and deploying centrifuges is a guide, Iran may not be able to deploy this machine on a production-scale for many years. Moreover, this line of centrifuge development may not function well and could be abandoned. In any case, this unexpected revelation about the IR-8 centrifuge confirms that a long-term nuclear agreement with Iran should limit research and development work on centrifuges to those less capable than the IR-8. He was quoted as saying in a televised interview that necessary mechanical tests have been conducted on IR-8 centrifuges, but that these centrifuges have not been injected with uranium hexafluoride gas. Running the IR-8 with this gas is necessary to understand its actual enrichment capacity. The lack of testing with gas suggests that the output of the IR-8 centrifuge is derived theoretically, and this theoretical estimate may be considerably greater than the output this centrifuge can achieve in practice using uranium hexafluoride. As will be noted below, the IR-1 centrifuge has an achieved enrichment output far below its theoretical upper limit. Currently, Iran has pledged not to inject the IR-8 centrifuge with uranium hexafluoride since to do so would violate the Joint Plan of Action (JPA) (and if undeclared, also its safeguards agreement). The IAEA reported in its most recent Iran safeguards report that no uranium hexafluoride gas had been injected into this centrifuge at the Natanz enrichment plant as of late August. 3 Although the IAEA recently visited one of Iran’s centrifuge R&D facilities, gaining more knowledge of Iran’s activities, and no evidence has emerged of secret enrichment in the IR-8 or other centrifuges, the IAEA cannot determine, with the current safeguards and JPA verification arrangements, if Iran has secretly injected gas into the IR-8 centrifuge at sites other than the Natanz or Fordow centrifuge plants. The recent visit to the centrifuge R&D center did not constitute an inspection. For example, the IAEA did not take samples able to determine the presence of enriched uranium at the site. However, even with these uncertainties in mind, as of today, there is no reason to assume that Iran has tested the IR-8 centrifuge with uranium hexafluoride. Does the Development of the IR-8 Centrifuge Violate the JPA? Another issue is whether Iran is violating the terms of the JPA by making IR-8 centrifuges. The interim agreement under the JPA permits manufacturing of centrifuges to replace broken ones. Was the IR-8 centrifuge complete prior to the JPA? Has Iran been producing IR-8 centrifuges beyond just replacing damaged machines? The IAEA reports do not indicate which types and numbers of rotors have been manufactured. Iranian centrifuge rotors are made of aluminum or carbon fiber, which means that the manufacturing equipment is different depending on the rotor material. Manufacture may occur in different locations, making answering these questions difficult. There are complex issues involving the negotiations of a long term nuclear agreement, which needs to include limits on future centrifuge research and development. Iran may be motivated to exaggerate the capacity of the IR-8 centrifuge to bolster Iran’s negotiating position and rebuff efforts to cap centrifuge R&D at a lower level. What does the value “24 SWU” mean? According to Salehi’s comments in the media, the IR-8 is reportedly a centrifuge with an output of 24 SWU. However, few would use such a unit to describe the enrichment output of a centrifuge. Typically, this value would be presented as a rate and would more carefully identify which type of SWU unit is being used, for example, whether a distance represents centimeters or inches. Thus, it is unclear whether Salehi meant 24 kg U SWU/year or 24 kg UF6 SWU/year. (ISIS uses the unit kg U SWU/year and shortens this notation to SWU/year in its publications.) A value measured in units of the latter would be about 50 percent greater than one measured in units of the former. So, 24 kg UF6 SWU/year would equal 16 kg U SWU/year. Salehi likely meant that this value should be a rate and thus would be 24 SWU/year. Support for this comes from one of Salehi’s earlier media statements when he was talking about the total enrichment needs of Iran. PressTV reported that Salehi said that Iran would need 190,000 SWU to provide the fuel annually (emphasis added) needed for the country’s power and research nuclear plants.6 This would imply that this value should be 190,000 SWU/year. Determining the type of SWU/year unit can be inferred by examining Salehi’s comments about Iran’s claimed enrichment needs. According to Salehi, “We need almost 190,000 SWU for an agreed time interval, meaning the next 8 years, to provide fuel for Bushehr nuclear power plant so that we can provide the fuel for this power plant, Tehran research reactor and Arak reactor after the end of our contract with Russia (which built the Bushehr nuclear power plant).”7 The enrichment needs of the Tehran Research Reactor and Arak reactor are a minute fraction compared with the needs of the Bushehr reactor. So, the vast majority of this 190,000 SWU/year would be to meet the annual enriched uranium needs of the Bushehr reactor. This statement can be used to determine if the units are kg U SWU/year or kg UF6 SWU/year. Further support for this interpretation is found in another Salehi’s comment. He said, “Iran’s first generation IR1 centrifuge machines have a nominal output of over 3 SWUs, but in practice they yield less than 2 SWUs.”10 In more traditional units, these values would become over 2 kg U SWU/year and less than 1.3 kg U SWU/year. These values are consistent with those customarily reported by Western governments and the IAEA, as respectively the nominal maximum and achieved values of the IR-1 centrifuge when operating as a single machine. When operated in production cascades, the achieved average value for the IR-1 is less than one kg U SWU/year. With that information, the units of the IR-8 centrifuge can be better understood. In this case, 24 kg UF6 SWU/year would equal 16 kg U SWU/year. When Salehi states the IR-8 centrifuge is 16 times more powerful than the IR-1, then the IR-1 centrifuge would have an enrichment output of 1.5 kg UF6 SWU/year or 1.0 kg U SWU/year. The latter is the value expected from publicly available information about the operation of the IR-1 centrifuges in production cascades at the Natanz and Fordow sites. So, in the case of the roughly 18,000 IR-1 centrifuges installed at Natanz and Fordow, Iran would assign an enrichment output of 27,000 SWU, or in the above units 27,000 kg UF6 SWU/year. In the case of more standard units, the equivalent output would be 18,000 kg U SWU/year. What is the IR-8 Centrifuge? If Iran is in compliance with the JPA and its safeguards agreement, the value of 24 SWU would represent a theoretical estimate of SWU/year, since in this case only mechanical testing would have been accomplished. Tests with uranium hexafluoride would be necessary to determine the actual enrichment output of this centrifuge. Iran has in the past provided what has been called the “target” output of its centrifuges. Salehi may in fact be providing a target output of the IR-8 centrifuge. Size. Little is known publicly about the characteristics of the IR-8 centrifuge. The IAEA reported that a casing for what may be the IR-8 centrifuge is installed but not connected at the Natanz pilot plant, but this centrifuge was not operational. The IAEA’s consistent mention of only the casing over many months would imply that the casing does not contain a rotor assembly. The length of this casing, according to several officials, is significantly longer than that of the IR-1 centrifuge and its width is wider than the IR-2m centrifuge, similar to the width of the IR-6 centrifuge. Longer length, like greater rotor wall speed, increases the enrichment output of a centrifuge. One official noted that the IR-6 centrifuge width is similar to an Indian centrifuge design of the mid-2000s. This design was revealed in an earlier ISIS report on India’s gas centrifuge program, taken from information publicly released by the Indian government in its purchasing system, or “tender” documents.11 The width, or diameter, of this rotor is 190 millimeters. In contrast, the diameter of the IR-2m is believed to be 145 millimeters or the same as the old URENCO G2 centrifuge, the design which A.Q. Khan stole, further developed in Pakistan, and later provided to Iran. The reasons for Iran choosing a greater diameter are difficult to know, since it would require a considerable amount of new work to design the new centrifuge and understand its behavior at this new diameter.12 One reason, however, may be that a wider diameter would allow a longer rotor segment (while preserving the subcritical nature of each rotor tube) with the resulting benefit being that the design would require fewer bellows to achieve a fixed centrifuge rotor assembly length. Equivalently, the longer length would allow an existing design of a two segment rotor assembly to achieve a greater enrichment output due to its longer length. The IR-2m design, for example, is two rotor segments each made from carbon fiber and a maraging steel bellow piece connecting the two segments together (see figure 1). If each segment were widened, each could also be lengthened with a proportionate increase in the centrifuge’s enrichment output. Iran may be trying to do something similar. However, without knowing the actual width or length of the IR-8 centrifuge rotor assembly, the impact of this change on enrichment output cannot be calculated. However, it should be noted that reducing the number of rotor segments and bellows would in theory be an advantage. Figure 1: Supercritical centrifuge schematic showing two rotor segments and one bellows. Theoretical enrichment output. The IR-8 centrifuge can also be understood by considering the two key variables determining its enrichment output, length and rotor wall speed. (The enrichment output does not depend directly on a centrifuge’s diameter.) Without data from the use of uranium hexafluoride, however, estimates are upper bounds of enrichment outputs. where H is the separative length, or effective length, of the centrifuge in meters and V is the rotor wall speed in meters per second. 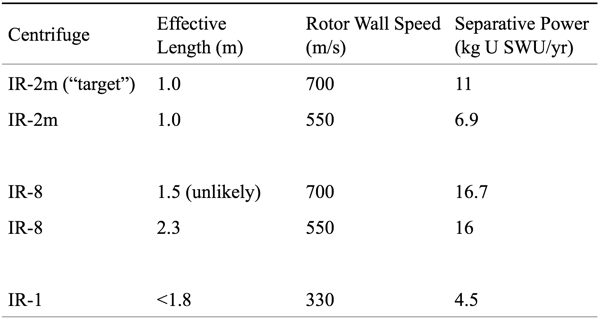 Table 1 lists several results, for differing effective lengths and rotor wall speeds. Note: It should be noted that the effective length, which is shorter than the total rotor length, is given roughly in this table; actual values are not publicly known and may differ somewhat from these values. But the results are not substantially affected. Rotor wall speed. Iran has not provided any information publicly about the wall speed of the IR-8 rotor. A simple analysis would suggest that the optimal wall speed is about 550 meters per second. This statement will first be shown to be true by looking for a contradiction, where the speed is assumed to be significantly greater, at 700 meters per second. First, assume the simple case where the IR-8 centrifuge has a similar output to a longer IR-2m centrifuge, apparently the most successful advanced centrifuge developed by Iran. The IR-2m is selected because more data is available about this centrifuge. In particular, the target enrichment capacity of the IR-2m centrifuge (with outer wall speed 700 m/s and an effective rotor length of approximately one meter) was about 11 kg U SWU/year.14 The IR-2m has two carbon fiber rotor tubes and one bellows, and thus an average effective rotor segment length of approximately 0.5 meters and an average output of about 5.5 kg U SWU/year per rotor tube. A machine with three carbon fiber rotor tubes with two bellows could therefore have a target enrichment capacity of roughly three times this average value, or 16.5 kg U SWU/year.15 Using this wall speed and assuming an effective length of 1.5 meters in equation (1) yields an enrichment output of 16.7 kg U SWU/year, very close to the above value derived from the target value of the IR-2m (see rows one and three in table 1). So, these derivations approximate the reported enrichment output of the IR-8, namely 16 kg U SWU/year, assuming an effective rotor length of 1.5 meters and a speed of 700 meters per second. However, since the IR-8’s length is significantly longer than the length of the IR-1 centrifuge, the assumed length and speed cannot be true. This contradiction would imply that if the length is longer, the wall speed is below 700 meters per second. Another reason to believe that the rotor wall speed will be less than 700 meters per second is based on past Iranian declarations. Iran acknowledged that it cannot achieve speeds of 700 meters per second, since it did not expect to acquire materials with the necessary quality to run a centrifuge at that speed. However, it said it expected to achieve a rotor wall speed of 550 meters per second. How long? Using the wall speed of 550 meter per second, the effective length, H, of the IR-8 centrifuge can be found from equation (1), where the enrichment output, or separative power, equals 16 kg U SWU/year. In this case, the effective length is 2.3 meters, or almost two and half times longer than the IR-2m’s effective length and significantly longer than the IR-1 centrifuge rotor (see table 1). Number of rotor tubes? If the effective length of the IR-8 centrifuge is taken at roughly 2.3 meters, how many rotor segments and bellows fit into this length? The first case is to assume that the IR-8’s rotor segment is about the same as the IR-2m centrifuge’s rotor segment, or 0.6 meters in length, where the effective length would be shorter. In this case, the IR-8 would require four rotor tubes and three bellows to achieve an effective length of 2.3 meters. 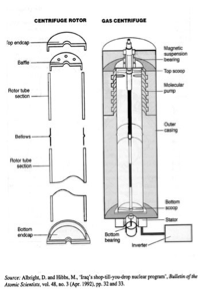 This doubling of the number of rotor tubes in the IR-2m centrifuge would represent a significant development, one in fact that could very well fail. A second case is to consider that an increase in rotor segment diameter allows a longer rotor; thus fewer rotor segments may be needed. If the widening of the IR-8 centrifuge diameter led to a longer rotor tube, say in a way similar to the Indian design, then the IR-8 rotor tube could be about 0.75 meters instead of 0.6 meters long. In this case, a three-segment rotor assembly would be somewhat greater than 2.25 meters, where the extra length would result from the two bellows pieces. The effective length of the entire rotor assembly would be shorter than the total rotor length, although exactly how much shorter is hard to estimate with the available data. Given the uncertainties in this derivation, however, the resulting effective length appears comparable to the length derived above from equation (1), namely 2.3 meters. Although this result is not conclusive, and depends on several assumptions, it nonetheless suggests that the IR-8 centrifuge may contain three carbon fiber rotor segments with two maraging steel bellows. In this case, the centrifuge development step posed by the IR-8 centrifuge appears simpler, one rotor length more than that of the IR-6, or IR-2m, centrifuge, and in line with expected developments in centrifuge design and development. However, the different diameter is a major change that would complicate development work compared to simply adding a rotor tube to the IR-2m centrifuge design. This analysis supports that the IR-8 centrifuge has three or four rotor segments and the rotor wall spins at a speed comparable to the IR-2m centrifuge. It also supports that the enrichment output of the IR-8 centrifuge when operated with uranium hexafluoride or in production-scale cascades will likely be lower than 16 kg U SWU/year. If the publicly reported IR-8 outputs are upper bounds, then the experience with the IR-2m centrifuges can shed some light on the expected performance of the IR-8 centrifuge if it operated in production-scale centrifuge cascades with uranium hexafluoride. Iran does not provide data about how well the IR-2m or IR-4 centrifuges enrich. ISIS has estimated that the actual values achieved by the IR-2m centrifuges when in a production cascade are currently about 3 to 5 kg U SWU/year, which table 1 shows is far below its target value of 11 kg U SWU/year or 6-9 kg U SWU/year at speeds of 550 meters per second. The reasons are primarily that Iran cannot achieve speeds of 550 meters per second and is instead achieving speeds of less than that. Moreover, additional inefficiencies develop when the centrifuge is used with uranium hexafluoride either alone or, particularly in the case of Iran, in production-scale centrifuge cascades. If the production-scale IR-8 centrifuge cascades operate in a manner similar to the IR-2m centrifuges, the actual output would linearly scale with length, at least roughly. For the case of an effective length of 2.3 meters, the enrichment output of the IR-8 centrifuge in production-scale cascades would be about 7-11 kg U SWU/year, or about seven to eleven times the output of the IR-1 centrifuge. Iran will likely need a long time to deploy the IR-8 centrifuge on a production scale. URENCO officials have said that it takes about a decade to develop a new type of centrifuge from the idea to production scale. If one considers Iran’s other centrifuges, timeframes of nearly ten years would likely also be needed to deploy the IR-8 centrifuge. Serious work on the IR-1 centrifuge started in the mid-1990s. Iran reached the point of large-scale deployment around 2004 or 2005. The first IR-2-equivalent rotors were spinning around 2003 or 2004; now they can introduce perhaps thousands of them. For the IR-8, Iran will likely need about ten years before it can deploy thousands of IR-8 centrifuges.